If you are considering buying a pet then please come and talk to us about exactly what care and costs will be involved without any obligation to buy. We are happy to spend as much time with customers as is needed to help them choose the most suitable pet for their household and lifestyle. We always check that any of our pets sold are going to buyers who have everything necessary in place for the animal’s care and welfare, plus that they have a suitable level of knowledge to keep the animal safe and cared for. For first time owners we are glad to go through a suitable care routine, provide handling advice and answer any questions they may have at any time. When buying a pet from us buyers are given our 24 hour contact numbers so that if they have any concerns about their new pet they can always get hold of us. We stock both Tropical & Cold Water fish and change the selection we have available regularly. Our suppliers are very helpful and will add on individual special orders to our regular deliveries to meet our customer’s requests whenever possible. If there is a particular variety you are looking for then please pop in to ask us and we will pass on your request. We keep a selection of beautiful Rainbow Budgies and Show Budgies in stock. They are priced at £25.00 each or £45.00 for a pair. We also stock a good selection of cages, feeds and all accessories at very sensible prices. We keep Syrian Hamsters in stock which are always well handled by us and completely used to human contact by the time we sell them. Each one is brought out of its cage every day to be held and smoothed gently first, then given fun time to run around and play in our playbox with tunnels, tubes, toys and treats to find. This is very important as hamsters which are not carefully and regularly handled from an early age can sometimes be very nervous pets which is disappointing for their purchasers. 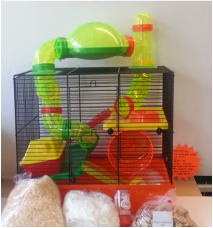 ​We also stock a good selection of cages, feed, bedding and all accessories at very sensible prices. We offer a selection of complete starter pack deals which are absolute bargains. They each include a really good cage complete with a house, exploring tubes or ramps and an exercise wheel plus a water bottle, feed bowl, bag of feed, bag of bedding and the hamster of your choice. Prices for these complete kits with your choice of hamster included start at just £44.99. We keep smooth coated ones, fluffy long haired ones and some which are a bit a bit fluffy but not too long haired in stock. These are all well handled to make sure they are confident and friendly little pets by the time we sell them. They are all gently cuddled and brushed every day which they seem to enjoy, often making adorable little "tribble" noises as they are brushed. 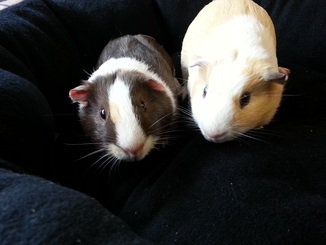 We always sell our Guinea Pigs in pairs as they should never be kept alone and they are just £60.00 for a pair. We also sell a good selection of very sensibly priced indoor cages, outdoor hutches and outdoor runs. If you buy a cage or hutch with your Guinea Pigs then we always offer you an additional discount.